"The author's easy prose and superior, simple organization makes this work an engrossing, entertaining, and educating read on issues important then that echo today in the modern debate on the limits of federal government power." "A statesman did what he could in his country's service, not what he would," writes H. W. Brand about Henry Clay but he could also have described John C. Calhoun and Daniel Webster with similar words. Clay, for example, by compromise fought to steer "the Union between the Scylla of jealous states' rights and the Charybdis of rampant centralism." These men and their nemesis Andrew Jackson grew up with the United States to serve their new nation. Clay, like Calhoun and Webster, however, never became president "the American people are fickle and easily swayed, and at the critical moments they turned from him." This book inspires thoughts of America's present political situation at every turn. John C. Calhoun, for example, "in serving South Carolina" when his state "pushed its cause to the brink of armed conflict with the national government," he managed with Clay and Webster to save the Union but he "tainted himself in the eyes of America." The author describes Daniel Webster as a man of great gifts in law and oratory that he sometimes wasted. His reply to Robert Hayne against Calhoun's states rights/nullification and in support of the tariffs he once opposed "would come to be considered the greatest speech in American political history" even though Webster later took criticism for defending slavery in the Compromise of 1850. "Spoken of as the 'great triumvirate,'—not always admiringly" these different politicians saved the Union at the cost of the ire of a divided partisan public divided. Webster found his Abolitionist constituents as much a liability as Calhoun did his slave owning planters. His opposition to the economic destitution caused by the Embargo and the War of 1812 resembled Calhoun's later support of the South's nullifying the Tariff of Abominations in 1832. Brands has these three giants cooperating as much from complex circumstance as design. Clay's political baggage included Aaron Burr, the War of 1812, and opposing slavery as a slave owner. Calhoun proved himself his own worst enemy on Florida, Nullification, and Andrew Jackson. Webster sought to "hold his home base maintain and his hopes for the presidency" and in the process became "as much a pariah outside of New England as John Calhoun had become outside of the South." 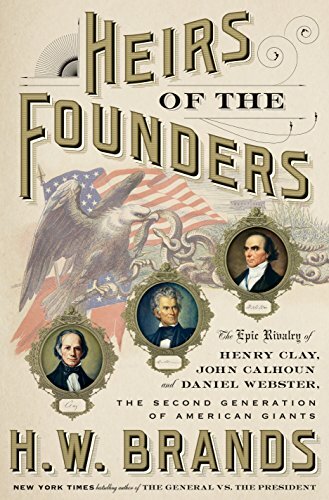 Heirs of the Founders looks more at how the three giants took different sides in changing circumstances, segmenting the book into the 1824 election, the Missouri Crisis, the Second Bank of the United States, the Peggy Eaton Affair, Texas, and so much more. Issues like slavery and tariffs run as threads throughout the chapters. Brands introduces the reader to more than ideas but also persons deserving better remembrance such as John Randolph of Virginia, William H. Crawford of Georgia, Thomas Hart Benton of Missouri, English writer Harriet Martineau, and Solomon Northrup of New York. The book moves events, ideas, and people to the Compromise of 1850 "what the struggle came down to during the lives of the three." Clay "looked to the day when the Southern economy would outgrow slavery, as the Northern economy had done." He imagined that the slow pace of the settlement of the Louisiana Territory would buy time for the change he hoped would take place. The discovery of gold in California, however, "compelled Congress to rule on the fate of slavery in the new American West." The author's easy prose and superior, simple organization makes this work an engrossing, entertaining, and educating read on issues important then that echo today in the modern debate on the limits of federal government power. Heirs of the Founders has documentation and illustrations.